Groundbreaking at the new UW Health Cottage Grove clinic, one of two new family medicine clinics opening this winter. 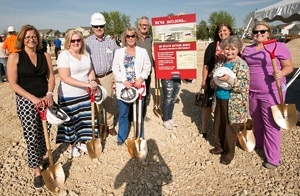 Construction began this spring on new, state-of-the-art UW Health family medicine clinics in Fort Atkinson and Cottage Grove. Both clinics are scheduled to open this winter. The 19,000-square-foot Fort Atkinson clinic will be located off highways 12 and 26, and will have up to 11 family medicine providers. The 14,000-square-foot Cottage Grove clinic will have up to seven family medicine providers. The clinics’ care teams will use a patient-centered approach to improve quality and patient outcomes. In addition to providing comprehensive primary care, both clinics will offer medical imaging and laboratory services. The clinics use a new-concept design that separates public spaces in the front of the clinic from the health care team’s private area in the back of the clinic. Groundbreaking at the new UW Health Fort Atkinson clinic. Exam rooms are dual access, with the patient entering one door and the provider coming into the room from a separate door connected to the health care team’s work area. The design also includes huddle areas for providers in the health care team’s work space for better communication, efficiency and functionality. The Fort Atkinson clinic is scheduled to open in February 2016; the Cottage Grove clinic is expected to open in December 2015.